Renal tubular acidoses (RTAs) are discrete renal tubular disorders that are characterized by the inability to excrete H+ in the urine, As a result, there is a positive H+ balance, causing metabolic acidosis. The net acid excretion is decreased, and some of the patients are unable to lower their urine pH < 5.5. 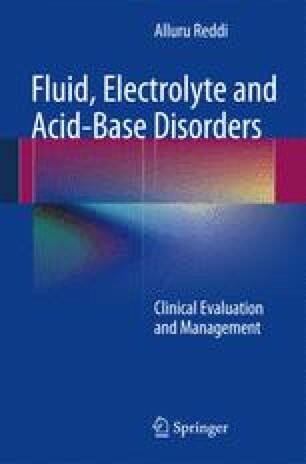 Despite severe acidosis, the anion gap (AG) remains normal because the decrease in serum [HCO3 −] is compensated for by a proportionate increase in serum [Cl−]. There are five types of RTAs: Distal RTA (classic or Type I RTA); Proximal RTA (Type II RTA); Incomplete RTA (Type III RTA); Hyperkalemic RTA associated with relative aldosterone deficiency or its resistance (Type IV RTA); and Hyperkalemic distal RTA associated with variable levels of aldosterone.